This is a sponsored post written by me on behalf of The Gorilla Glue Company for IZEA. All opinions are 100% mine. 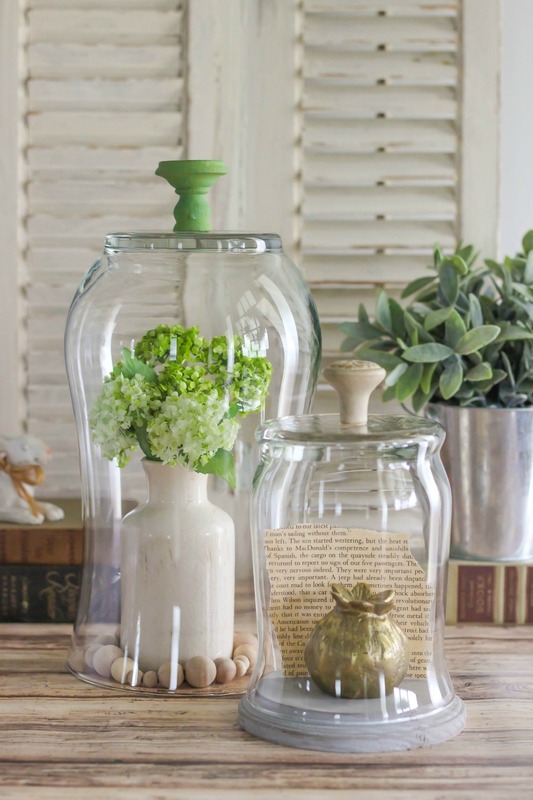 Create a DIY Glass Display Cloche with Knob with a glass vase, hardware knob, and Clear Gorilla Glue®. This is a beautiful, easy, and inexpensive home decor project. Clear Gorilla Glue® is new to the market and its clarity is perfect for this glass craft. We would love our readers to enter to win a $250 Visa Gift Card and one lucky winner will be chosen at random. 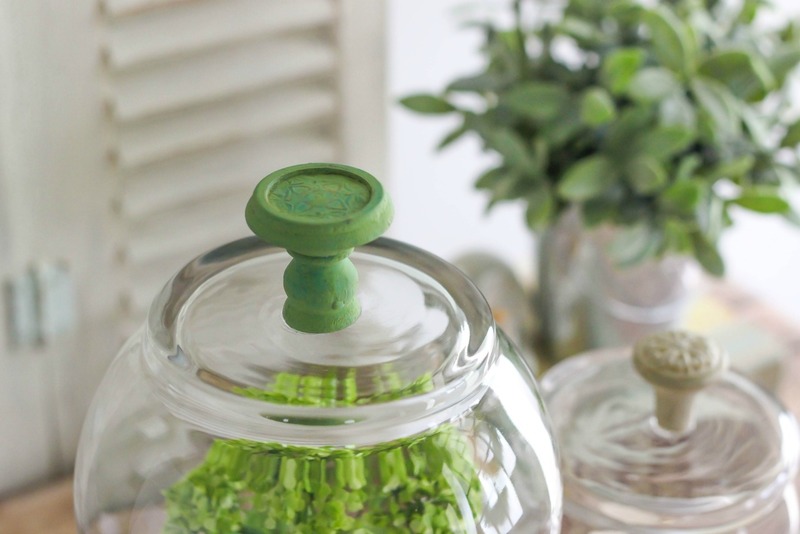 Make sure to check out the easy tutorial on the DIY Glass Display Cloche with Knob and enter the giveaway at the end. I have been on the lookout for glass domes for awhile now. I love how they look and they seem to be popping up more in the home decor trend. Unfortunately, they can be really expensive. I thought I would make my own and I am so thrilled at how they turned out. 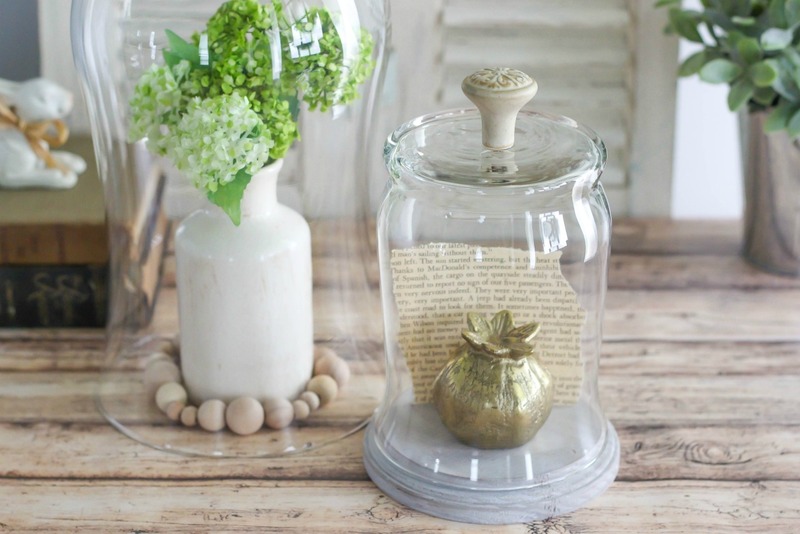 This DIY Glass Display Cloche with Knob was super easy to make. You just need three supplies and one tool. Let me show you how easy it is! 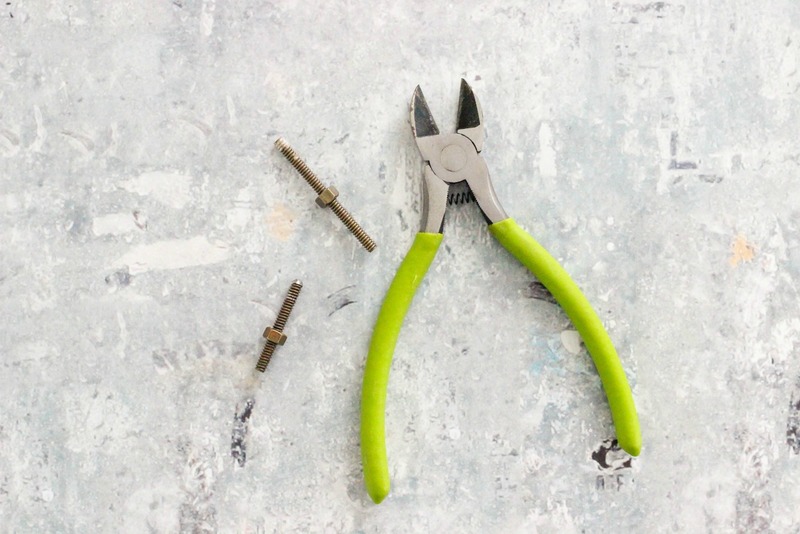 I started by removing the screws from the decorative hardware knobs by using a pair of wire cutters. The screws may unscrew or they may have to be cut. Next, I took a damp cloth and wiped the bottom of the glass vases. I placed the Clear Gorilla Glue® on the bottom of the knobs and firmly placed them on the bottom center of the vases. Then, I put some books on top of the knobs and let the glue cure for 24 hours. The easy to use crystal clear glue is water resistant, non foaming, and incredibly strong. I love the fact that if I didn’t have the knobs exactly in the center I could easily move them and then use the damp cloth to wipe away the glue. The glue is so clear and works great on glass and also can be used on Wood, Stone, Metal, Ceramic, Foam, and More. This next step is totally optional but I like the look. I made a wood base for the smaller glass display cloche using a wood plaque and paint. 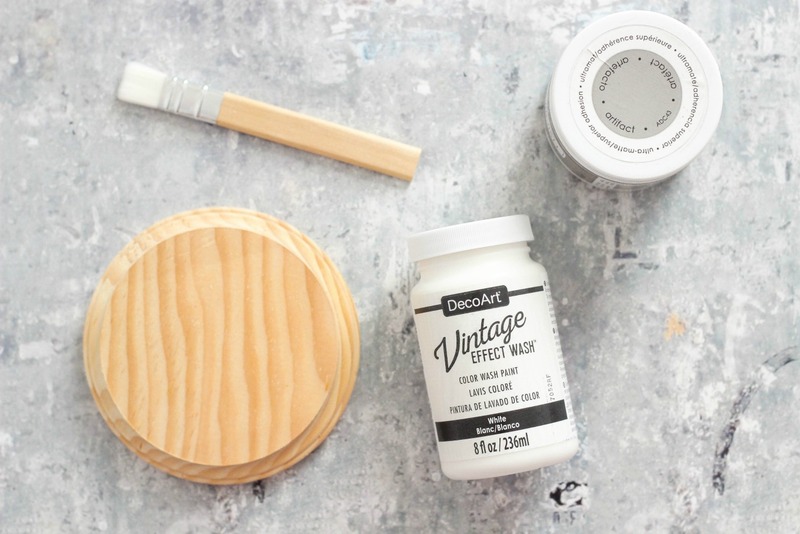 I painted one coat of gray chalky finish all over, then used a rag to wipe the vintage effect wash in white. This looks like white wash and adds a nice dimension. That’s it! I was able to make both of these DIY Glass Display Cloche with Knob for less than the price of one from a home decor store. I love that I was able to customize the colors of the knobs and wood base to match my living room decor. I like the addition of the knobs because I can pull on them instead of removing the cloche with my hands and getting fingerprints on the glass. 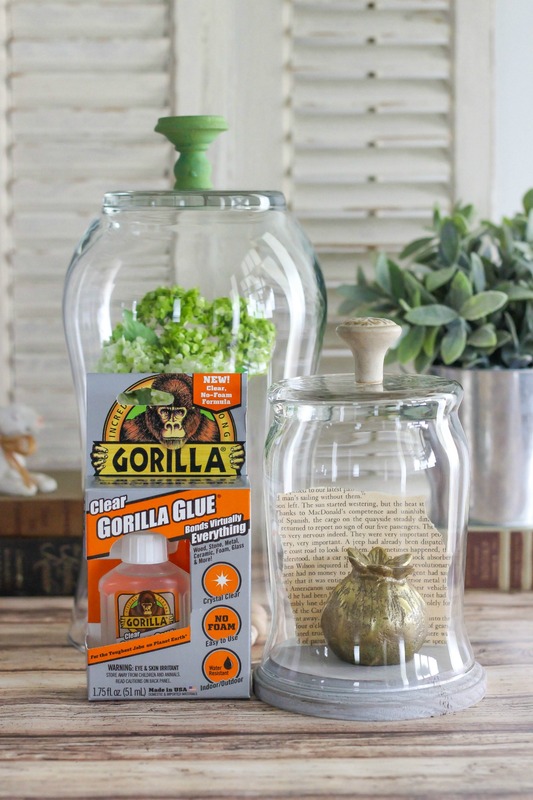 I was so pleased at how easy and durable the new Clear Gorilla Glue® is. This is a sponsored post written by me on behalf of Clear Gorilla Glue® for IZEA. All opinions are 100% mine. Wow, it is a great idea. For a long time I found a unique and handmade gift to my mom to give in this mother’s day and now I found it. It look beautiful. After finding this blog I know how I can set a gift with this glass. Thanks for this great idea. What a lovely idea. I may have to have a go. I love this! I’ll definitely be trying this out at home, thanks for the great idea! Oh I love this! I will have to pick up the clear glue. I haven’t seen it in stores here yet. Thank you for the giveaway! Love Gorilla Glue! And Great post! Love this. I was looking for something to put on my kitchen table. I can’t wait to make it! Love this diy! Do you mind sharing where you got the knobs? So happy I found your blog! I love this idea! I will be using this for gift keepsakes! 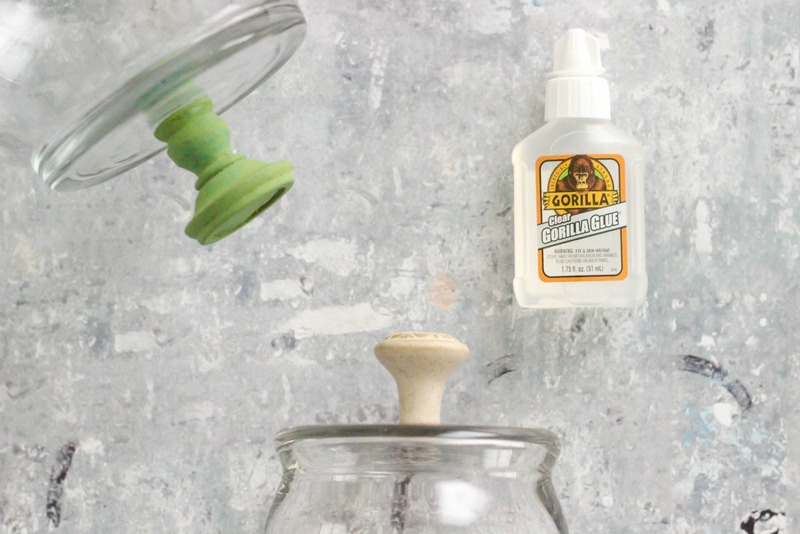 we love this glue, but I hadn’t ever thought of this idea. I love these glass domes! These would be a perfect addition to my bookshelf. 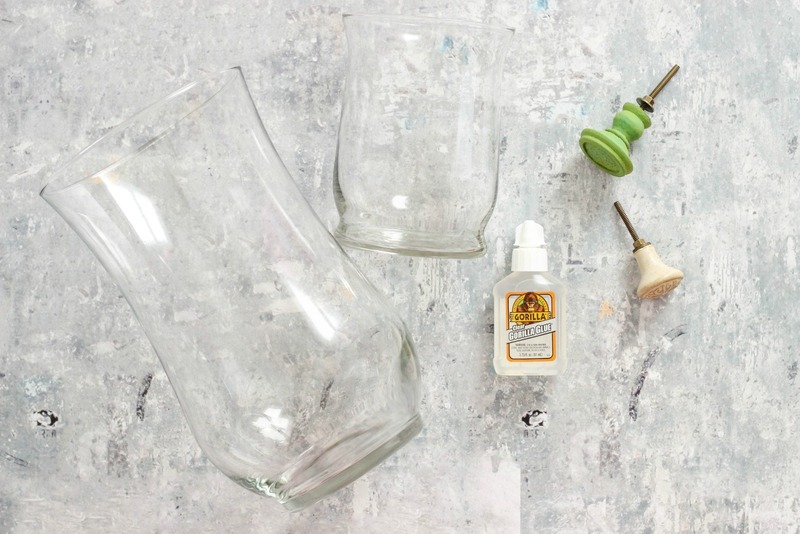 Love this idea of glueing instead of drilling a hole. Gurella glue and glass dome is all I need to buy, I have lots knobs picked up from yard sales, have spray paint, chalk paint, enamel paint, acrillic paints of any color. Easy project that I just might do today ! Tks so much! I have a Gone With the Wind heirloom clock that is very important to me but the dome broke (even when it was in one piece I was constantly wiping off the fingerprints). This is the perfect fix!